Kladdkaka (Swedish gooey cake) is a dense sticky chocolate cake - which I have just removed from the oven. 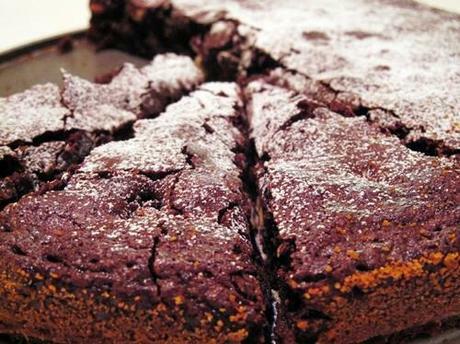 This is a very simple and quick chocolate cake recipe from the Scandilicious Cook Book by Signe Johansen. Melt the butter in a saucepan over a medium heat, once melted remove from heat and add the chocolate, stir in until melted and leave to cool. Meanwhile whisk your 4 eggs and your 200g of caster sugar, add the cooled but still fluid chocolate and butter mixture and then carefully fold in sieved flour trying not to loose too much of the air from the whisked eggs. Pour into the tin and place in the center of the oven for 12-13 minutes, don't be tempted to leave it in longer, the aim is to end up with something like a gooey browny, not a dry cake. Leave to cool in the tin and keep in an airtight container for up to 3 -4 days. Serve will freshly whipped cream.